1. What is the state of the Serbian real estate market like, where is the sector heading, what are the main challenges and the biggest projects planned in the upcoming period? 2. 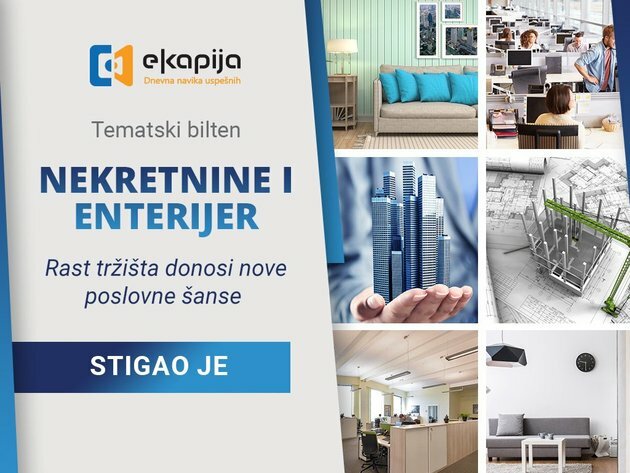 How does intensive building influence the prices of real estate in Serbia, where is the biggest demand and how do housing loans influence the sale? 3. What are the main trends in interior design? Which materials are most used and how much do companies take care of the business premises interior nowadays? 4. What does the new Housing Law mean for housing units? How many buildings have opted for professionals managers, and how many have put their trust in neighbors? 5. How do new technologies influence the construction and how many “smart buildings” have been built in Serbia so far? To what extent do purchasers take care of the energy efficiency of facilities? We talked to Vlatko Djuricek, the director of CTP for Serbia, about their plans for the Serbian market and the development of operations in Central and Eastern Europe. Vladimir Sojic, the director of Galens Invest Novi Sad, talks about the latest projects, investments and residential-office complexes they plan to build in the next two years. The consulting company CBS International, a member of Cushman & Wakefield Group, presents the projects Wellport – the first condominium in New Belgrade, Skyline – in Kneza Milosa Street, and Vozdove Kapije in Vozdovac. Zepter Real Estate announces the construction of a new office-residential complex in Block 65. CBS International also presents the project Business Garden, as an excellent office space in the center of Belgrade, whereas MPC Properties has started the realization of the Navigator Business Center 2 project in New Belgrade. The first LC Waikiki store in Serbia has opened in Zemun Park, the retail park built and managed by the Israeli company MIVNE Group. Nikola Nedeljkovic, General Manager of Belgrade Waterfront, presents a new concept of housing and the planned features at BW in his interview, whereas Airport City Belgrade announces the construction of another building in 2019. The Zagreb-based company Beton Lucko continues the successful cooperation with scientific institutions and presents an innovative facade system and noise protection solution. The director of the Sabac-based company SET presents the latest projects and relates the story of this company, which went from being a small family business to being present in big construction sites throughout the country. In the section dedicated to interior design, Galerija Podova presents its floor covers as an important basic element of the design of business premises, residential, hospitality and retail facilities, whereas Ecophon, Saint-Gobain emphasizes acoustics as an important factor of well designed business premises. CPI Group has successfully completed three phases of the construction of the Paunov Breg settlement, and has now also presented a new building, Trg, where the first residents should move in in late 2019. Tarkett has launched a new generation of LVT floors, and Generali Insurance presents an app which allows the user to contract a home protection policy in several clicks. The entire contents of the newsletter can be seen HERE. We invite you to be a part of our special edition newsletters: present your operations and the services you offer in the market, your plans for the upcoming period, give us your view of the topic and further increase your visibility with the readers of our portal. The topic of the next newsletter are Smart Cities.